You have now designed your first module over LDD or LDraw, or you have downloaded the building instructions of the GBC module you wish to build. Excellent. Now is then the time to list the bricks you’ll need to build your module. Except if you are the lucky owner of a massive Lego bricks collection, this step might lead to a small frustration. Indeed, while starting with GBC modules building, you’ll for sure be tempted to start with the building of GBC masterpieces. However, you’ll sadly discover that these amazing machines are often made with a huge number of parts, several of them being on top quite specific and uncommon. When I’ve started with GBC, while trying to reproduce my first modules, I’ve discovered the existence of some Lego parts I would not at all imagine they would exist. If you do have to order parts, you of course need to know… which parts you need to order. ➡ The first and easiest one is to download directly the parts list from Planet GBC. For most of the GBC modules referenced on this website with building instructions, go to the page describing the module, in the section called “GET THE BRICKS YOU NEED TO BUILD THIS MODULE”, and simply download the list of parts in Excel format, or other available formats. 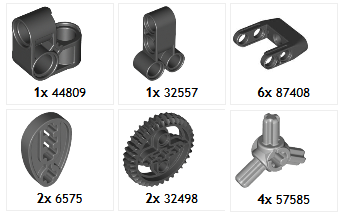 ➡ If you have designed your GBC module in Lego Digital Designer (LDD) or if you are using LXF building instructions downloaded from Planet GBC, then you can generate the parts list directly from the tool. Open the LXF model with Lego Digital Designer and simply select the menu option “File” > “Export BOM”. The outcome of this action will be a readable, sorted and illustrated list of parts, in Excel format, including standard Lego references. Note: Depending on which website you want to place you order on (check page Get the bricks at the best price), you might have to get this list in a different format. However, the Excel list remains quite convenient to use in order to browse and retrieve easily parts required to build your module. ➡ If you have designed your GBC module in LDraw or if you are using MPD or LDR building instructions downloaded from Planet GBC, then you can also generate the parts list directly from the tool. For a MPD file, you first have to extract the LDR files it contains. 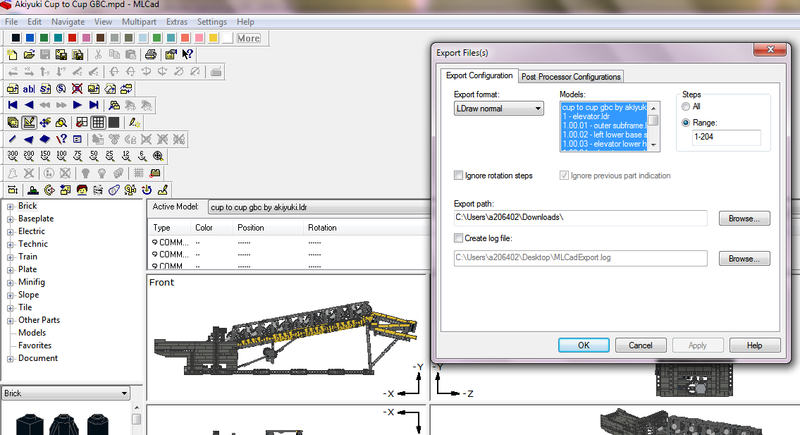 Open LDraw MLCad tool and select the menu option “File” > “export”. In the popup, choose “LDraw normal” as export format and select the models you wish to export (by default, all models are selected). Click on the “Ok” button and the tool will generate files with extension LDR. To get parts list from a LDR file, you have to open LDraw LDView tool. In the tool, select the menu option “Tools”>”Parts List” and click on “ok” in the popup. The outcome of this action will be a readable, sorted and illustrated list of parts, in HTML format, including standard Lego references. Thanks to the previous section, you know now how to get the list of parts you need to build your modules. There are plenty of other actions you can perform on your parts list, playing with file format and content. Planet GBC will most likely issue in the coming months a dedicated tutorial on this subject. But in the meantime, I encourage you to have a look at JC Tchang webpage, hosted on Philo website. This page (in French) is offering a really huge list of Tips and Tools you can use to design your modules, merge/split/convert file formats or optimize generation of building instructions.